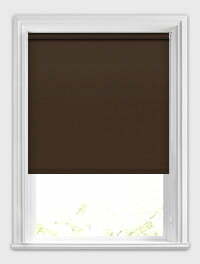 If you love rich natural and neutral browns amongst your homes décor, then our gorgeous custom-made brown roller blinds will do just that. With a fabulous choice of smooth plains and wonderfully rustic and organic textured designs, there is a fabric to suit any style of interior. Brown is a great colour for creating a warm earthy look in any bedroom, living or dining room. From light brown to dark chocolate, they will bring a luxurious look to any home. Here at English Blinds you will find a wonderful collection of designer brown fabric roller blinds, varying in tones and texture, to ensure that you find exactly the style and design you are looking for to compliment your rooms décor and really add the wow factor to the windows. The blind was made to order according to my specifications, and was delivered very quickly. It is exactly what it wanted. Great quality at a very fair price. No areas need improving in my opinion. I would recommend to others.